Following three sell-out screenings as part of a collaboration with mental health arts festival First Fortnight, Meetings with Ivor will open at the Irish Film Institute from Friday, February 10th. The IFI welcome back director Alan Gilsenan and Ivor Browne for a sold-out opening night screening and Q&A. 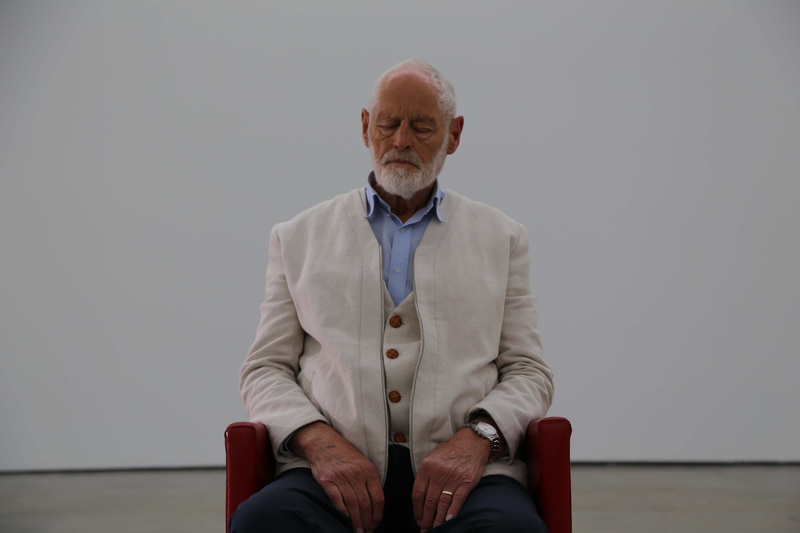 Produced by Tomás Hardiman, Parzival Productions, and funded through the Sound and Vision Scheme of the Broadcasting Authority of Ireland, Meetings with Ivor is a documentary on the life and work of ground-breaking psychiatrist Ivor Browne. Browne has been a central figure in Irish mental health for many decades. His pioneering and often controversial work on behalf of the many who cannot speak for themselves is well-known. Alan Gilsenan’s new film captures the essence of this extraordinary man. In a quirky and challenging cinematic portrait we meet Browne, now in his late-eighties, who is still full of energy, good humour and compassion, and who remains a deeply-informed, startlingly innovative thinker. His unique attributes continue to find vital expression and offer real hope in an increasingly bewildering world. The film contains contributions from a host of familiar faces including Tommy Tiernan, Tom Murphy, Mary Coughlan, Sebastian Barry, and Nell McCafferty. Tickets for the Q&A on the evening of February 10th have sold out. Tickets are now on sale for two additional screenings (without Q+As) on February 10th at 13.15 and February 11th at 18.00. Showing times and tickets for all other screenings will be available on Monday, February 6th from www.ifi.ie or by calling the IFI Box Office on 01-6793477. Meetings with Ivor was previously screened as The Wonder Eye. Irish Paraguayan Feature Documentary “ELIZA LYNCH – Queen of Paraguay” is close to completion with acclaimed Irish actress Maria Doyle Kennedy playing Eliza. Produced by Stuart Switzer of Ireland’s Coco Television, the documentary captures the epic story of Irishwoman Eliza Lynch, the “Queen of Paraguay” in a story of hunger, war and wealth, of family, love, tragedy and loss. A love story between the beautiful, imperious Eliza, Heroine of Paraguay and the President Francisco Solano Lopez, is one of the most intriguing, and yet one of the least known epic lives of modern history. Directed by renowned Irish director and film-maker, Alan Gilsenan, this powerful documentary film ‘ELIZA LYNCH – Queen of Paraguay’ tells the story of this epic catastrophe through the eyes of Eliza Lynch. Born in Charleville, County Cork in 1833, she was the most famous woman in all of South America in the 19th century; and, as deliberately distorted by her enemies, the most infamous. Shot in many locations in Paraguay, Argentina, Brazil, France, England and in Eliza’s native Ireland throughout 2012, the final scenes of ‘ELIZA LYNCH – Queen of Paraguay’, were shot in Feb 2013 with Maria Doyle Kennedy, methodically and at times eerily, embracing the dynamic character of Eliza Lynch. Eliza is dramatically cast as both her younger self and her role in older years. In depicting her later years she is played brilliantly by Maria Doyle Kennedy, whose acting credits include award winning roles in The General and The Tudors and most recently in the ITV Dramas Downtown Abbey and Titanic. She began her acting career in Alan Parker’s landmark film The Commitments. As a young woman in Paraguay Eliza is played by famous Paraguayan model and Olympic athlete, Leryn Franco; who beautifully captures the spirit of a young Eliza Lynch. Based on 18 years of original research in 10 countries by two Irishmen, the former diplomat Michael Lillis and the historian Professor Ronan Fanning (whose book The Lives of Eliza Lynch, the documentary is based upon), ‘ELIZA LYNCH – Queen of Paraguay’ reveals for the first time the human trajectory of Eliza’s own turbulent life. Stripped of layer after layer of calumnies accumulated by her enemies over a century, the extraordinary truth now emerges. Beautiful, sophisticated, glamorous, but above all gutsy, generous and astonishingly devoid of malice, Eliza had her faults: at times high-handed, at times selfish. ‘ELIZA LYNCH – Queen of Paraguay’ documents her unique love story, ‘a love story of the damned’; how Eliza met in Paris in 1854 the son of the President of Paraguay, Francisco Solano Lopez then, at 28, a mega-rich, intelligent diplomat-General (she was 20); how she became his uncrowned Queen of Paraguay, how, though they never married, she bore him seven children, how, though she had several opportunities to escape with her children, she stuck by him through unending disasters throughout the unspeakable horrors of the War of 1864 until his death in the last battle in 1870 and how she continued to love him until she herself died in lonely circumstances in Paris in 1886. “It is a hugely exciting challenge and, indeed, a privilege to make a film on the life of Eliza Lynch.” says Director Alan Gilsenan. “When I first read Michael Lillis and Ronan Fanning’s seminal biography, I was really gripped by the epic potency of this extraordinary tale. But I’m also slightly daunted by the responsibility – for, while Eliza is proudly Irish by birth, she is truly Paraguayan in her heart and remains very close to the hearts of the people of that wonderful country, a country that I have come to know and love during the making of this film. This feature length drama documentary will run for approximately 75 mins. ‘ELIZA LYNCH– Queen of Paraguay’ will be screened at a private event in front of President Franco and invited guests in Asuncion, Paraguay on Wednesday 10 April in the Auditorium of the Central Bank of Paraguay. Following the screening, the documentary will be immediately submitted to leading international film festival, generating awareness and recognition for the documentary, Eliza Lynch and Paraguay world-wide. Thereafter, “ELIZA LYNCH – Queen of Paraguay”, will be released in Paraguay and then around the world. The project is supported by the Irish Film Board, the Broadcasting Commission of Ireland Sound & Vision Fund, Irish Tax Incentive Section 481, RTE, Abbeyfield Group and Sudameris Bank and Hibernia Misiones of Paraguay and has had invaluable help and logistical resources of the Paraguayan Government. Eliza Lynch became the National Heroine of her adopted country, Paraguay. Eliza epitomised the heroic struggle of the Paraguayan people in the War of the Triple Alliance of 1864 to 1870 against the combined forces, the Triple Alliance, of giant Brazil, huge Argentina and smaller Uruguay. The War is without equal in modern history for its grim harvest of death, suffering and destruction. Over 90% of the men and boys aged over seven of Paraguay perished and 50% of her women and girls. Paraguay, the most advanced country in the region, was driven back to the Stone Age. Coco Television are in discussion with a number of international studios about creating an international TV drama series based on the life of Eliza Lynch. An undeniable phenomenon, The Clancy Brothers and Tommy Makem hit the chic folk scene of 1960s New York with a bang that resonated worldwide. The songs that they shared with the world have since become a staple of the Irish cultural image internationally, but is this a positive or a negative thing? This is what divides people about the Clancy Brothers. To some, they are troubadours of traditional Irish folk music, but to others they represent a tiresome stereotype and a culturally damagingly cliche. After over 50 years in the business, the only surviving member of the band, Liam Clancy, has joined forces with filmmaker Alan Gilsenan to make The Yellow Bittern, a deep and dark look at the life and times of a musical icon. Charlene Lydon sat down with Liam and Alan to gain insight into the process behind making the documentary.